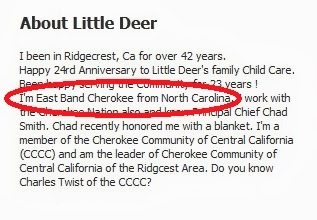 Carolyn Emerson Durvin (aka Little Deer Durvin) claims she is Eastern Band Cherokee. But she isn't from the Eastern Band of Cherokee Indians in North Carolina. Call them. Ask. I assure you, they have no one by the names Little Deer Durvin, Carolyn Emerson, Carolyn Emerson Durvin, Carolyn Durvin, etc...enrolled. This has been verified more than once by fellow Cherokees. 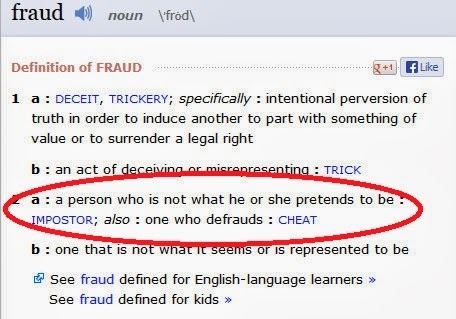 According to the definition at Merrian-Webster, a fraud is a person who is not what he or she pretends to be. Carolyn Emerson Durvin (aka Little Deer Durvin) pretends to be Eastern Band Cherokee but she isn't. 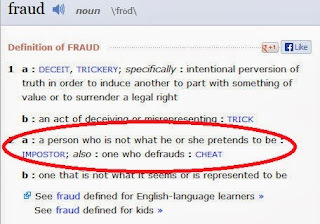 Therefore, she is a fraud. This is not one of those cases of one saying, "I'm Cherokee but can't prove it." This is worse because she outright claims to be Eastern Band Cherokee KNOWING she isn't. In 2010, she was presented a blanket from then Principal Chief of the Cherokee Nation, Chad Smith. From an article about the blanket dated October 13, 2010, Durvin is described as Eastern Band Cherokee. But, less than one month earlier, in an Ancestry.com message board post, she was looking for help with her "Cherokee ancestry". 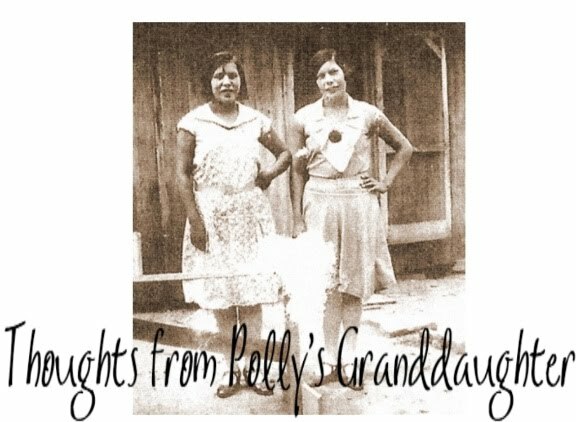 And two years later, in another message board post, her husband was still trying to help her connect to her "Cherokee ancestors." 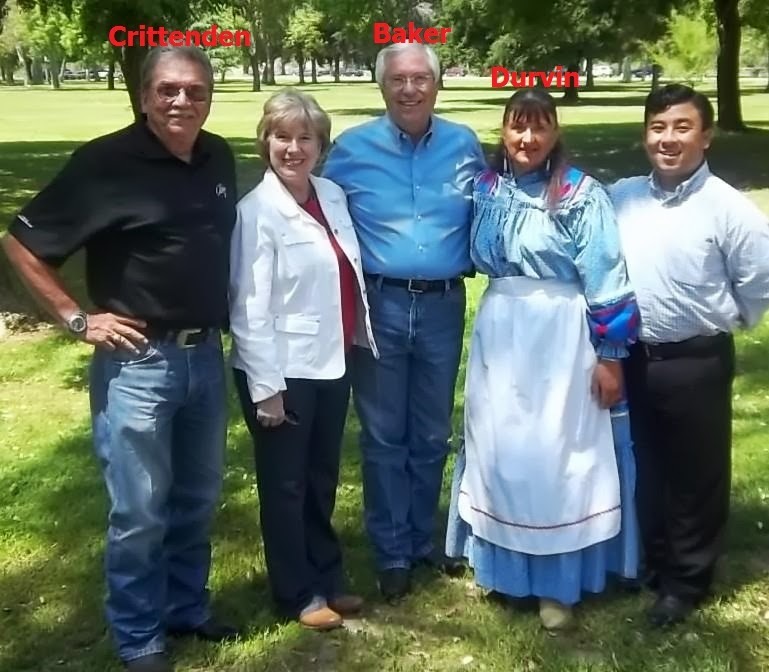 This means that, as of 2012, Carolyn Emerson Durvin, knew she still had nothing to connect her to the historical Cherokee Nation, but she continued claiming to be Eastern Band Cherokee. 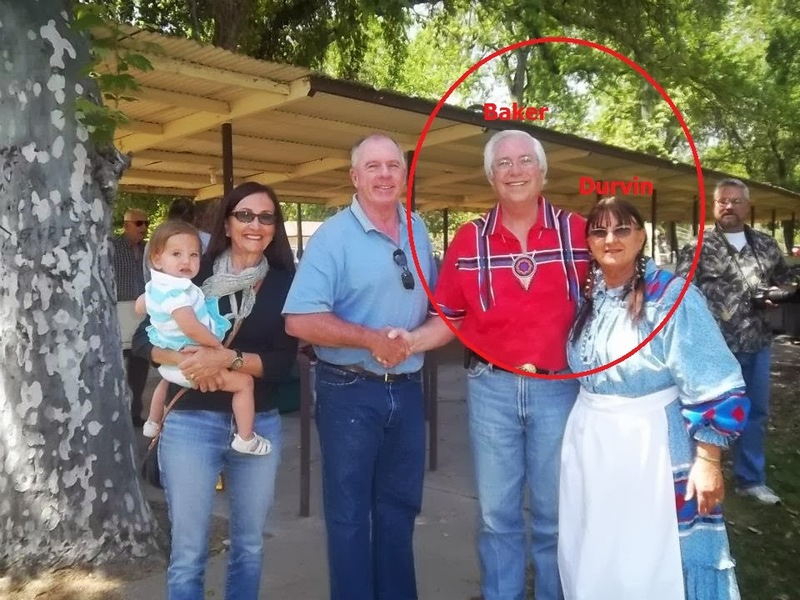 To make matters worse, the woman has engrained herself into the Cherokee Nation At Large communities and fooled at least two of our Principal Chiefs of the Cherokee Nation, Chad Smith and Bill John Baker, by claiming to be Eastern Band. If she would have claimed to be a Cherokee Nation Cherokee, she would have opened herself up to their inquiries about her citizenship. I guess she couldn't risk that, so she went with something she saw as more "safe." Of course her lies started to unfold when, in November 2011, Durvin used words that would make it seem as if she was a citizen of the Cherokee Nation (instead of the Eastern Band) by using the word "our" as in OUR people and OUR new principal chief. I guess Miss Eastern Band Cherokee forgot Bill John Baker was elected Principal Chief of the Cherokee Nation, not the Eastern Band! Check out the pictures of her with our chiefs and current deputy chief. Doesn't it just make you sick? Durvin isn't registered or enrolled as a Cherokee. She can't even prove she has Cherokee ancestry. But for some reason, she believes she has the right to get up in Cherokee business, running an At Large group and rubbing elbows with our tribal leaders. She goes into her community and misrepresents herself as Cherokee. She even claims to be an Eastern Band Cherokee storyteller and goes to schools and community groups sharing what she says are our stories and legends! Fakes and wannabes, like Durvin, wiggling their way into our At Large groups is why real Cherokees are now leaving those groups. They are tired of wannabes thinking they know best and that they should be in charge of everything. Enough is enough. Ms. Carolyn Emerson Durvin, aka Little Deer Durvin, has gotten on the last nerve of many authentic Cherokees. Either she is Eastern Band Cherokee and can prove it or she is a fraud who has been deceiving a lot of people for a long time. *Several Cherokees made screen prints before the comments were deleted so we could show the inconsistencies in her story. We have been watching her for a while, well aware that she is not what she claims to be. It's sad that these charlatans are infiltrating our tribal gatherings and communities. 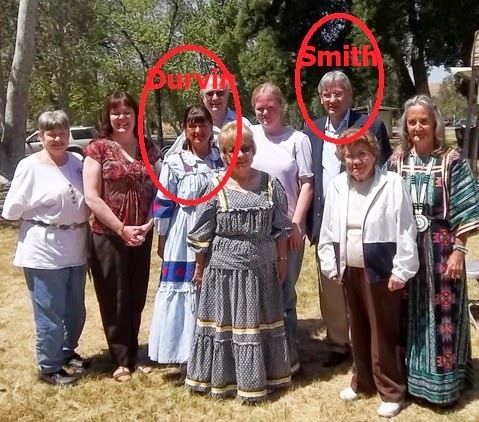 Why are they being allowed to participate and hold positions without having proof they are Cherokee? Thank you Twila for this expose'. I met Little Deer for the first time this year at the CN picnic in Bakersfield. Charles Twist and others have repeatedly referred me to her when I have asked questions about local events and so on. For example, at this picnic,there were no forms to renew our membership in the CCCC, something that we have always had on hand at local events. When I asked him about the membership forms, Charles referred me to Little Deer. Furthermore, communication about CCCC's local events has become weak at best. I was the founding facilitator, and I am concerned about issues like representing ourselves and our members honestly, about truthful discourse, and about communicating with our community in a timely and coherent manner. You are correct in stating that she has insinuated herself in all aspects of this local community (CCCC) and of the one in Ridgecrest. ... The main reason I stepped down from leadership is because, during an election, only one candidate was promoted. If anyone tried to discuss other possibilities, that person was asked to refrain from doing so and told that the meetings and the events are apolitical. Ha! Pam, You and I have encountered very similar experiences at two separate at large community meetings. I distinctly recall a conversation that I had with Charles about 2 years ago, when he related to me and a friend his frustrations about there being too much 'pan indianism' being brought into the Bakersfield group. He was markedly happy with the cultural shift that has taken place since then, in with what the Nation has been bringing to them. However, these things he spoke of still persist in that group, perhaps to a lesser degree. This issue of non-Cherokees/wannabees in positions of power continues to be ignored by our administration and by the council. Not only that, I have personally witnessed Julia Coates giving favor/preferential treatment to non-Cherokees over Cherokees in at large community matters. As a direct result of this issue I have ceased my involvement with my local community. As an interesting turn of events, the particular non-cherokee person that I have been at odds with in the Inland Empire group has relocated to the Tahlequah area with her "claiming Cherokee heritage - but unenrolled" husband. Cherokee Nation created this monster, she's not in my backyard anymore~ she's in Cherokee Nations house now. They will now reap what they sowed in what seems to be one of many de novo Cherokees they are investing their time and money in. It is my hope that in the future, if these at large communities are to exist for any reason other than politicking, that the Cherokee Nation be more interested in ensuring that council or board members of said communities are actually enrolled citizens. Perhaps if we had less 'wannabees' showing up, increased numbers of enrolled citizens would be more likely to come and we could all begin acting like a real Cherokee community instead of some New Age Intertribal Squash blossom Rainbow Pow Wow. Our Cherokee AT Large Communities sponsored by the Nation were meant to act as "Little Embassies" to the Nation for at large Cherokees. Instead some have been infiltrated by people such as Little Deer... We have many very good At Large Communities and when this happens it puts all of them in a bad light.. It has made many real Cherokees step away from being involved in some of these communities because the non Cherokees get themselves on the Board and next thing you know they are teaching classes on our culture, language, basket weaving - you name it. Then they don't care about giving information about our government and happenings inside the Nation.. Considering the small number of At Large voters who requested a Ballot this upcoming election - one could theorize that these AT Large Communities are lacking in their duty as being "Little Embassies" for the At LArge Cherokee people.. I know you are much into exposing wannabes and "not real Indians." Here's how I see it. In the Indian world, those who have BIA ”cards” are considered “real Indians” and those who don’t, aren’t. It’s a sad commentary, really, because it draws a line in the sand and actively, systematically encourages both discrimination and the eventual elimination of Indian tribes, well, of government sanctioned Indian tribes, as we know them. Why? Because unless the tribal members “marry native,” eventually, their blood quantum, the percentage of Indian blood they carry, will be reduced to under the amount required for tribal membership, a percentage established by the tribes themselves. Then there won’t be issues about obtaining that precious BIA card from the government that identifies them as “Indian,” and entitles them to a number of services, because there won’t be any more “Indians.” They, along with the BIA who issues the cards, will have legislated themselves into the group of “have nots,” the “not real” Indians that the card carrying Indians so often disdain. Indeed, the line in the sand that includes/excludes the BIA card and tribal membership encourages discrimination both inside of and outside of the Native community. I have often wondered if this is just another kind of long-term institutionalized genocide, one that Native people and tribes have bought into in order to obtain the services today that their people need. In time, the “Indians” will be gone, in another generation or two, which was, after all, the original intention of the government – to exterminate the Indians one way or another – through death, sale into slavery, religious conversion, assimilation – anything to make them non-Indian and to “go-away,” of course, leaving their precious land behind. By the tribes’ own definition of who is and is not an Indian, they will shrink their own numbers until they become extinct or so small as to be inconsequential. So the government doesn’t have to do anything, except wait, because the “shrinking” criteria for being “Indian” has been established and agreed to by all parties involved. Why, you might ask, wouldn’t the Indian tribes simply change their definition of blood quantum to include more people? That is a political question, and the answer even more so, but in essence, there is a pot of money, often including casino revenue, and the pot must be divided by the number of tribal members. Some tribes have actually tightened their membership requirements. I'm not holding my breath that you may come around to my way of thinking. I lived in Oklahoma for 36 years and met a number of BIA card carrying Indians who think the way I do. I was friends with a Creek elder who told me, "If your family told you they were Indian, then you are Indian, whether you have a CDIB card or not. The government has no business telling anyone who they are." You are correct that the Cherokee Nation has no minimum blood quantum. I could find no blood quantum information on the Eastern Band or Keetoowah Band. It could be the same as the Cherokee Nation. The point of my previous post applied to all tribes and bands. If a person with just 5% Cherokee blood and qualifies for CDIB card and membership in the Cherokee Nation is considered a "real Cherokee Indian", that still means she's 95% something else--a racial mixture of other native tribes and/or non-native blood--but still legally a member of the Cherokee Nation. However, being legally enrolled in a native tribe is not the same as being culturally or traditionally native. Having a CDIB card just means the U.S. government recognizes you as a "real Indian". Cherokee Nation citizenship does not require a specific blood quantum. 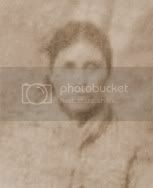 It does require that you have at least one direct Cherokee ancestor listed on the Dawes Final Rolls, a federal census of those living in the Cherokee Nation that was used to allot Cherokee land to individual citizens in preparation for Oklahoma statehood. To be eligible for a federal Certificate Degree of Indian Blood and Cherokee Nation tribal citizenship, you must be able to provide documents that connect you to a direct ancestor listed on the Dawes Final Rolls of Citizens of the Cherokee Nation with a blood degree. This roll was taken between 1899-1906 of Citizens and Freedmen residing in Indian Territory (now northeastern Oklahoma) prior to Oklahoma statehood in 1907. If your ancestor did not live in this area during that specific time period, they will not be listed on the Dawes Rolls. Many applicants do not qualify for CDIB/Citizenship as their ancestors did not meet the enrollment requirements of the Dawes Commission and were not listed on the Dawes Rolls. Certain requirements had to be met in order to be placed on the Dawes Roll, such as being listed on previous Cherokee rolls and proven residency in the Cherokee Nation. That last part (and proven residency in the Cherokee Nation) indicates that it's not enough just to have been listed on previous Cherokee rolls, but the person must meet both requirements. That, in my opinion, means that someone of Cherokee blood who was listed on another roll but living outside the Cherokee Nation would not be recognized as a citizen of the Cherokee Nation. Would you say they were not a "real Cherokee Indian"? Just curious, since you seem to hold yourself out as an expert on who is and isn't a real Cherokee Indian. Those who can document descent from an actually Cherokee, but who are not eligible for registration with the Cherokee Nation are considered descendants. No one has ever disputed that. You say your comment was included for "all tribes." As I stated earlier, I don't speak about all tribes. I only write about the Cherokee people. The Cherokee Nation has very liberal citizenship requirements with no minimum BQ. The UKB requires one to have a BQ of 1/4 or more. The EBCI requires one to be 1/16 or more. And contrary to what you seem to believe, I don't decide who is a "real Cherokee Indian". Cherokee law does that. I just follow the law. If i have heard once i have heard it a thousand times. BQ is not a criteria for citizenship in the Cherokee Nation. Why do people always quote the Dawes roll as why they were excluded from citizenship?? Have they not heard of the Guion Miller roll done in roughly the same time??? Which had no such requirement for location but is an excellent roll to determine if indeed a person has cherokee roots today. ugh why do they always use that, another point there are now 19 federal tribes that use the same criteria as cherokee nation including the rest of the 5 civilized tribes Osages,Quapaws,Potts and on and on. Its the tribes own ability to determine citizenship that is important. I never hear anybody complain about some of the Apache Tribes in New Mexico they have some of the strictest requirements one of your parent's must be fullblood and live within the community!!!! There you go have at it!! !